Aymeric Laporte is having a great start to the season for Manchester City. The former Athletic Club Bilbao player is a regular pick for Pep Guardiola and is proving to be a good signing for the Premier League champions. But, L’Equipe have a Wednesday article doubting whether he’ll be in France’s squad announced on Thursday. Didier Deschamps has routinely preferred a long list of others to Laporte, including calling up Crystal Palace’s Mamadou Sakho in October, and, despite the City player’s form, there’s no guarantee things will change. L’Equipe say it’s led to ‘a form of incomprehension’ in the player’s camp and has fed a feeling the footballer is being treated differently to others. 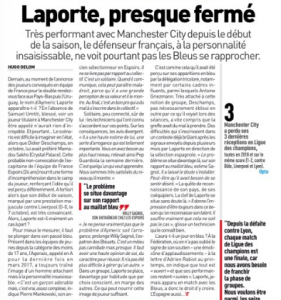 To understand the full picture, the French newspaper explains Laporte’s past with his country’s youth teams needs to be examined. “He’s an adorable boy, but it’s true, quite complex,” Pierre Mankowski, who coached Laporte in France’s age restricted sides, is quoted as saying. L’Equipe state former coaches feel the footballer is sure of himself, and for some that’s to a fault. Willy Sagnol, who has also coached Laporte, doesn’t think arrogance is specifically a problem. Some in the France set-up do feel Laporte’s approach is an issue, with Antoine Greizmann being named as one, and with Deschamps so intent not to harm the collective spirit it’s making things harder. Flirting with declaring for Spain is also perceived to be a problem and an example of the player’s character.